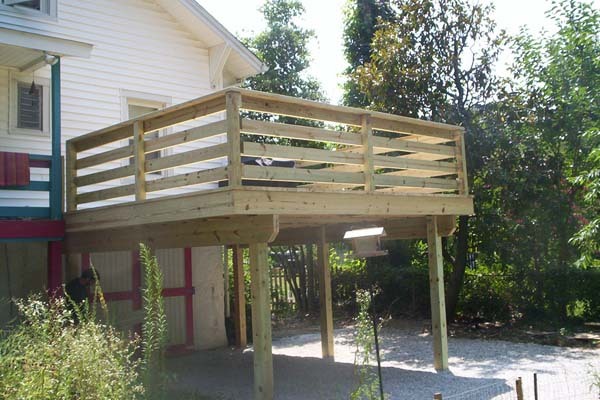 With the weather cooling you may use your deck less and less, but that does not mean you should neglect. Actually, the contrary is true. The harsh winter weather can wreak havoc on your deck. This is why it is important to properly clean and perform preventative maintenance on your deck this fall. Fall Deck Maintenance Tips: Cleaning is the Key! When it comes to fall deck maintenance, cleaning is the key. It is the maintenance step that must precede all other maintenance steps. Sweep up any debris. And do not forget to remove leaves, dirt, and twigs from the areas between boards. Clean the surface of the wood. You can do this one of two ways. First, you can mix equal parts bleach and water and scrub your deck clean. Or you can rent a power washer and blast your deck clean. Apply a sealer. A deck sealer will repel water and make your deck last longer. Clean your deck throughout winter. Yes, you may not be actively using your deck, but if leaves, snow, and debris are left to sit on your deck, the excess moisture could damage your deck and promote mold and mildew growth. This entry was posted on Wednesday, September 26th, 2012	at 8:54 pm	. Both comments and pings are currently closed.